Do you, my friends love that smell of napalm in the mornings? Does it fill you with confidence about the future - your own and that of the rest of the world? For if you do answer 'Yes' to both of these questions, congratulations: you've made it into the American values (on average). Democratic cornerstones of political leadership and the media are trusted by less than 50 percent of the Americans, 27 percent to 41 percent. Command & control institution of the military is trusted by 79 percent. Scepticism over coercive power and centralized counter-democratic system based on rank-command trumps all the softy stuff. even educators are more trusted in the settings involving more deterministic decision-making (e.g. medical sciences and sciences) than in more polemical setting (e.g. general education). 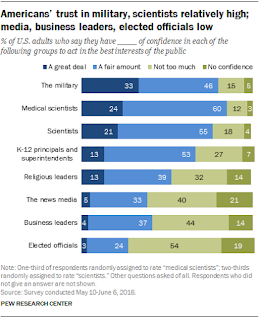 Yes, yes, I hear you, the choir of Patriots: but in a democratic society, military is subject to democratic checks and balances, so why is this degree of confidence in military a matter for concern? Firstly, irrespective of the democratic or other checks and balances, military is not a pluralist institution that encourages debates, inquiries, and discoveries through dissent. In other words, while military may be framed into the broader democratic constraints, it cannot by itself be a genuinely democratic institution. There is no democracy in command systems. Secondly, to anyone pontificating on democratic checks and balances, may I suggest revisiting the entire modern history of the U.S. to identify exactly at what point in time did democratic checks and balances imposed onto military do their jobs before the damages were incurred? In Vietnam? Nope. In multiple military engagements in Latin America? Nope, again. In the Balkans? Not really. In Afghanistan or Iraq? Not at all. 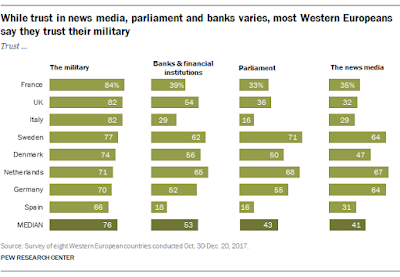 Thus, in real terms, checks and balances do not define a democratic set of values that put strong public preference in favour of the military ahead of much weaker preferences in favour of the immediate democratic and pluralist institutions, such as politics, media, business, education. 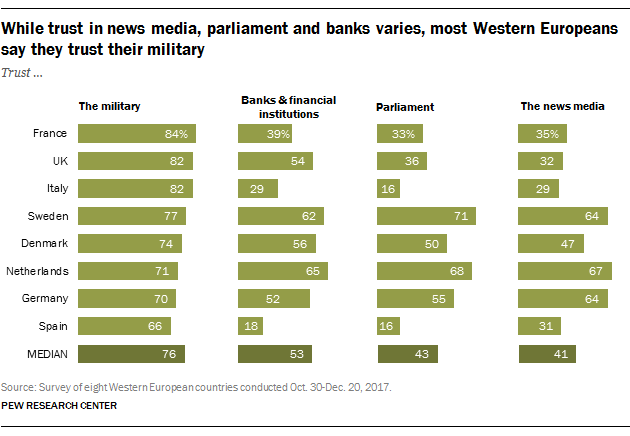 What is happening, thus, as revealed by the above data, is the strong drift in public preferences away from democratic and liberal foundations of our modern states and toward more command and control, more coercive power-based institutions, such as military. 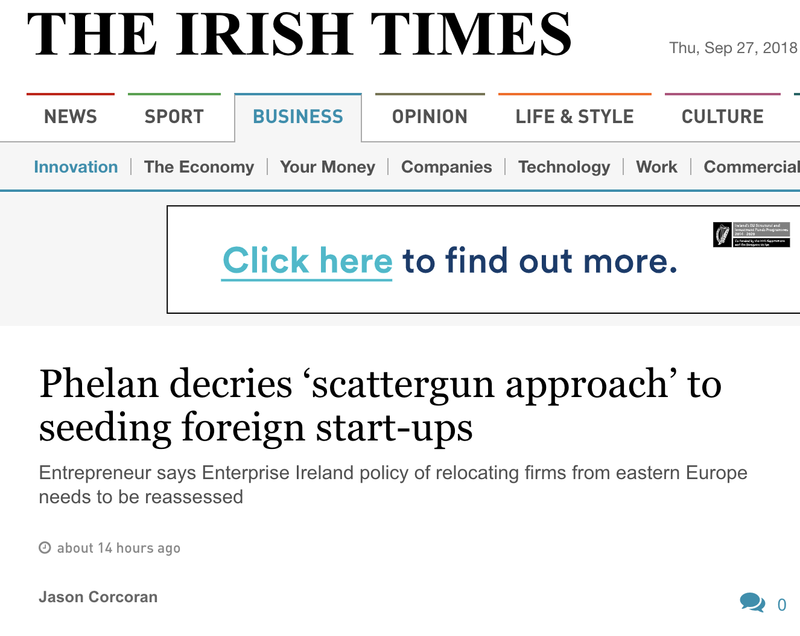 To paraphrase one semi-failed leader of the past: it's public values de-democratization, stupid. Pimco's monthly update for October 2018 published earlier this week contains a handy table, showing the markets changes in key asset classes since September 2008, mapping the recovery since the depths of the Global Financial Crisis. As Pimco put it: "The combined balance sheets of the Federal Reserve, European Central Bank, Bank of Japan, and People’s Bank of China expanded from $7 trillion to nearly $20 trillion over the subsequent decade. This liquidity injection, at least in part, underpinned a 10-year rally in equities and interest rates: The S&P 500 index rose 210%, while international equities increased 70%. Meanwhile, developed market yields and credit spreads fell to multidecade, and in some cases, all-time lows." Increases in valuations of corporate junk bonds have been leading all asset classes during the post-GFC recovery. This is consistent with the aggregate markets complacency view characterized by extreme risk and yield chasing over recent years. This, by far, is the most mispriced asset class amongst the major asset classes and is the likeliest candidate for the next global crisis. Government bonds, especially in the Euro area follow high yield corporate debt in terms of risk mis-pricing. This observation implies that the Euro area recovery (as anaemic as it has been) is more directly tied to the Central Banks QE policies than the recovery in the U.S. 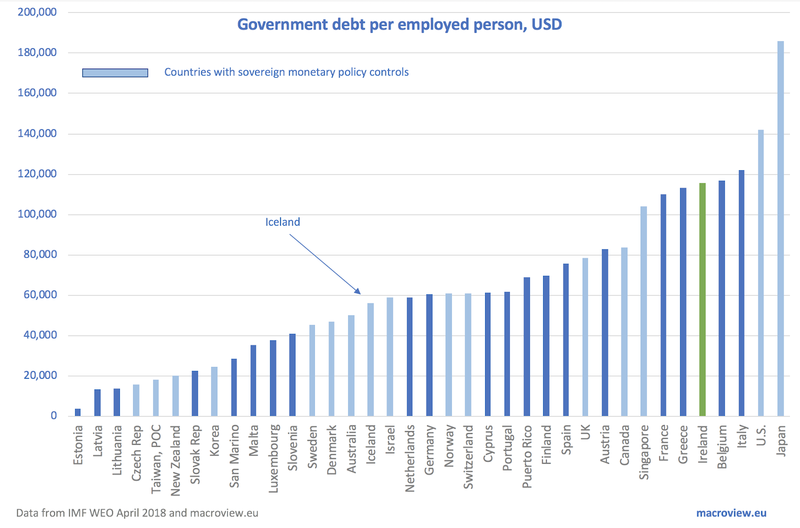 It also implies that the Euro area recovery is more susceptible to the Central Banks' efforts to unwind their excessively large asset holdings. 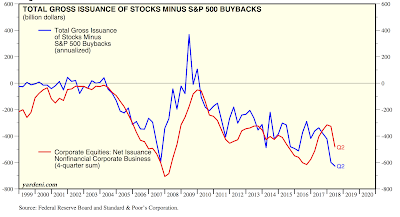 U.S. equities have seen a massive valuations bubble developing in the years post-GFC that is unsupported by the real economy in the U.S. and worldwide. Even assuming the developed markets ex-U.S. are underpriced, the U.S. equities cumulative rise of 210 percent since September 2008 looks primed for a 20-25 percent correction. All of which suggests that the financial bubbles are (a) wide-spread and (b) massive in magnitude, while (c) being caused by the historically unprecedented and over-extended monetary easing. The next crisis is likely to be more painful and more pronounced than the previous one. An interesting study (H/T to @stephenkinsella) highlights the problems with empirical determinism that is the basis for our (human) evolving trust in 'Big Data' and 'analytics': the lack of determinism in statistics when it comes to social / business / finance etc data. Here is the problem: researchers put together 29 independent teams, with 61 analysts. They gave these teams the same data set on football referees decisions to give red cards to players. They asked the teams to evaluate the same hypothesis: are football "referees are more likely to give red cards to dark-skin-toned players than to light-skin-toned players"? Due to a variation of analytic models used, the estimated models produced a range of answers, from the effect of skin color of the player on red card issuance being 0.89 at the lower end or the range to 2.93 at the higher end. Median effect was 1.31. Per authors, "twenty teams (69%) found a statistically significant positive effect [meaning that they found the skin color having an effect on referees decisions], and 9 teams (31%) did not observe a significant relationship" [meaning, no effect of the players' skin color was found]. To eliminate the possibility that analysts’ prior beliefs could have influenced their findings, the researchers controlled for such beliefs. In the end, prior beliefs did not explain these differences in findings. Worse, "peer ratings of the quality of the analyses also did not account for the variability." Put differently, the vast difference in the results cannot be explained by quality of analysis or priors. The authors conclude that even absent biases and personal prejudices of the researchers, "significant variation in the results of analyses of complex data may be difficult to avoid... Crowdsourcing data analysis, a strategy in which numerous research teams are recruited to simultaneously investigate the same research question, makes transparent how defensible, yet subjective, analytic choices influence research results." 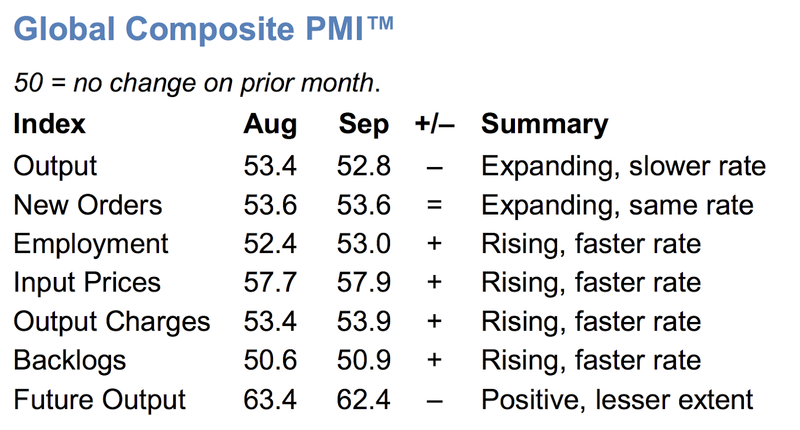 Now, let’s take a look at the BRIC Composite PMIs that combine Services and Manufacturing sectors growth signals. 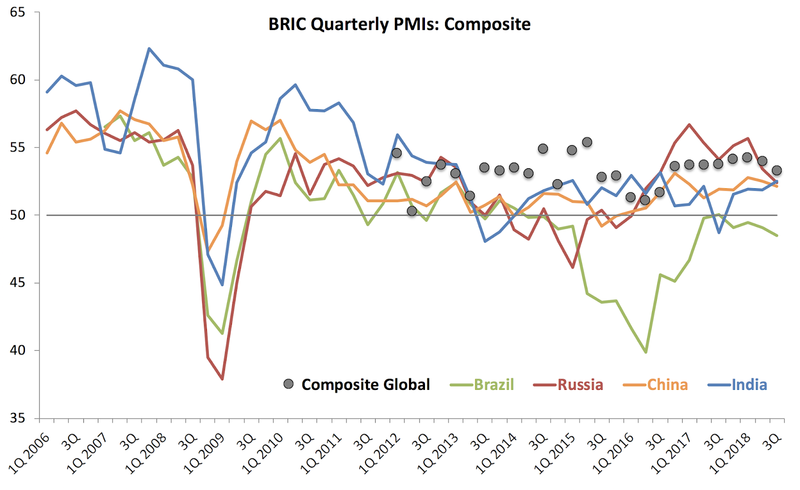 As Global Composite PMI signalled slowing growth momentum in the global economy, BRIC Composite PMIs all trailed global growth indicator. Brazil Composite PMI fell deeper into contraction territory in 3Q 2018 (48.5) compared to 2Q 2018 (49.1), marking the fourth consecutive quarter of contraction in the economy, as signalled by the combination of PMI indices in Services and Manufacturing sectors. 3Q 2018 was the lowest Composite PMI reading for the South America’s largest economy in 6 consecutive quarters. Russia Composite PMI slipped from 53.4 in 2Q 2018 to 52.4 in 3Q 2018, marking slowdown in the rate of economic expansion. This was the lowest reading in Russia Composite PMIs since 2Q 2016. Despite this, Russia Composite PMI was the second largest in the BRIC group (marginally below India’s 52.5 reading). China Composite PMI posted a modest decline in the growth rate falling from 52.5 in 2Q 2018 to 52.1 in 3Q 2018, the latter reading marking the lowest rate of expansion in 3 quarters. In fact, China Composite PMIs have been singling weak growth dynamics in every quarter since 4Q 2016 - something that is yet to be reflected in the official growth figures for the country. India Composite PMI bucked the BRIC trend and rose from 51.9 in 2Q 2018 to 52.5 in 3Q 2018, for the first statistically significant growth signal in 5 quarters. 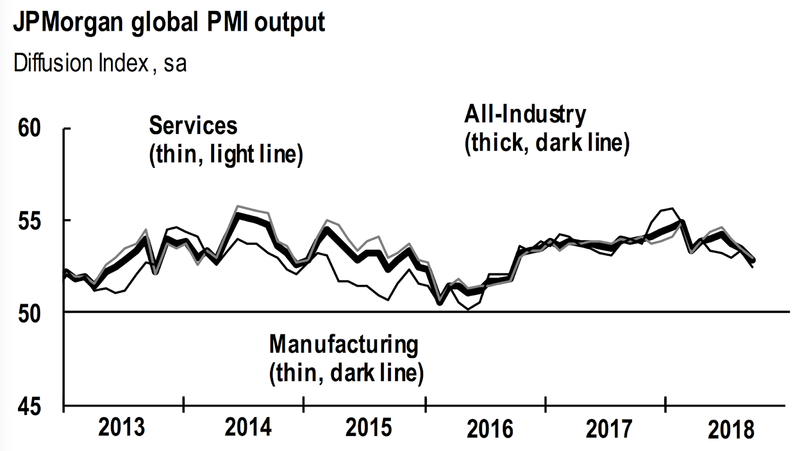 Despite this, growth momentum in India remains below global PMI levels. Global Composite PMI declined from 54.0 in 2Q 2018 to 53.3 in 3Q 2018. 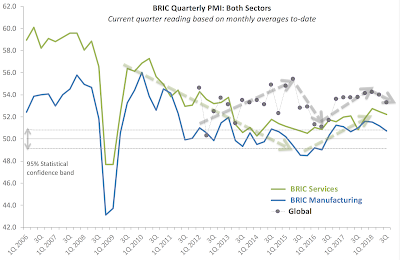 Overall, slowing global growth momentum is being matched by a slowdown in the BRIC economies. 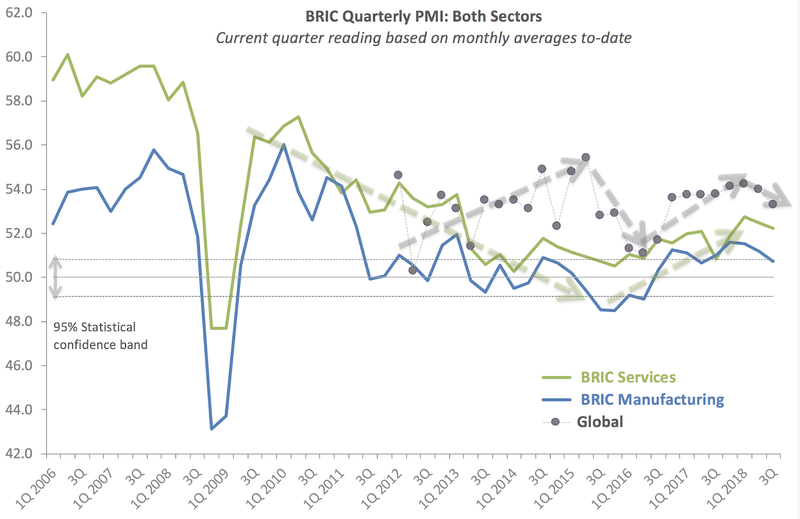 Both Manufacturing and Services sectors of the BRIC economies are underperforming their Global counterparts and the overall trend is toward declining global and BRIC growth. Having covered Global Composite PMIs for 3Q 2018 here: http://trueeconomics.blogspot.com/2018/10/31018-global-pmis-tanked-in-3q-2018.html as well as BRIC Manufacturing PMIs here: http://trueeconomics.blogspot.com/2018/10/11018-bric-manufacturing-pmi-dips-down.html, here is an update on BRIC Services PMIs for 3Q 2018. In summary: things are getting less promising for 2H 2018 growth in world's largest emerging and middle-income economies. Brazil Services PMI posted second consecutive quarter of contraction in 3Q 2018, falling from 48.8 in 2Q 2018 to 47.9 in 3Q 2018. Since 3Q 2014, Brazil's Services PMIs posted readings below 50.0 mark (zero growth mark) in all, but one quarter (1Q 2018 when the PMI was at 51.0). Importantly, 3Q reading was statistically significantly below 50.0 mark. 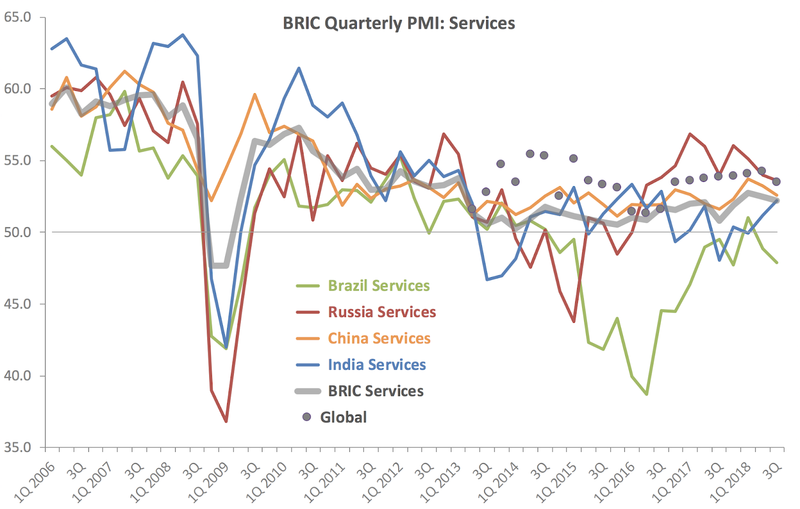 Overall BRIC Services PMI computed by myself based on Markit data and global economy weights for BRIC countries, has moderated from 52.5 in 2Q 2018 to 52.2 in 3Q 2018, suggesting weakening growth momentum in the Services sector of the BRIC economies. This development was in line with the Global Services PMI movements (down from 54.2 in 2Q 2018 to 53.5 in 3Q 2018). 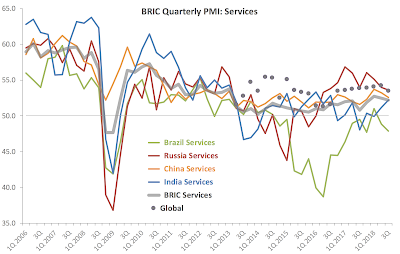 For BRICs, Services PMI is now at the lowest reading in three quarters, and for the Global Services PMI - in 7 consecutive quarters. 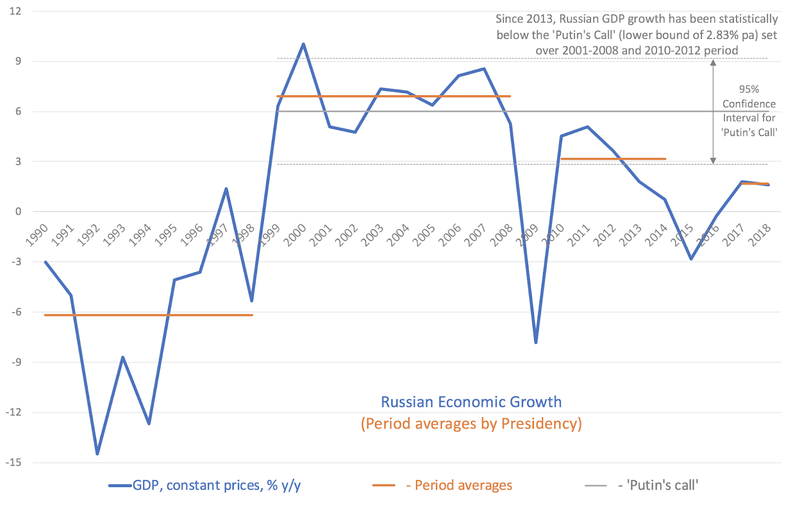 The above clearly shows that since 2013, Russian economic growth has statistically underperformed the 'Putin's Call' levels of growth, defined as rates of growth in real GDP achieved during the period after the immediate post-1998 crisis recovery and into 2012, omitting the period of the Global Great Recession impact of 2009. 'Putin's Call' rate of growth is set at around 6% pa, with the 95% confidence interval around this at [2.83, 9.15]. The lower bound of this confidence interval is important. 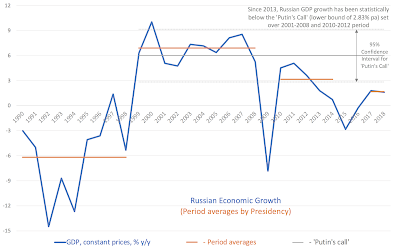 While no one can expect the Russian economy to grow at the 'Putin's Call' levels of 6%, let alone the upper bound levels of 9.15%, Russian economy does require longer-term average growth rates at around 2.8-3%, slightly above the lower bound of the 'Putin's Call'. 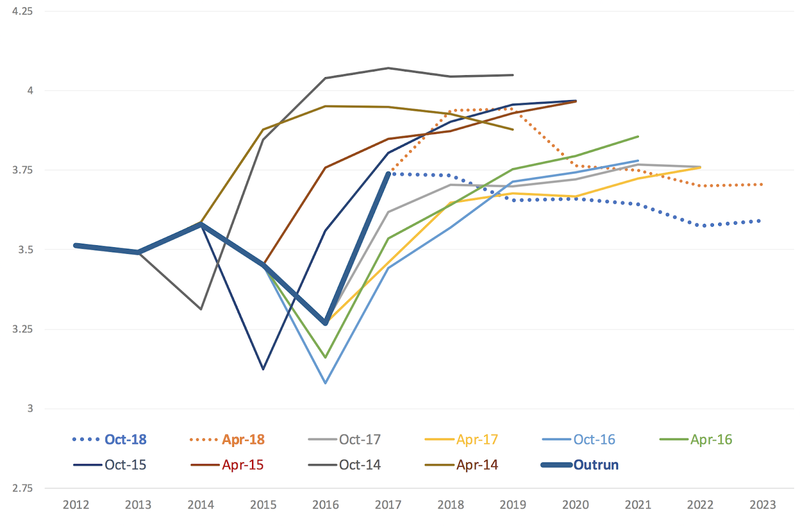 As of consensus forecasts forward, the economy is expected to expand at around 1.5-1.8 percent pa over 2018-2023, which implies significant cumulative underperformance relative to medium term growth requirement. 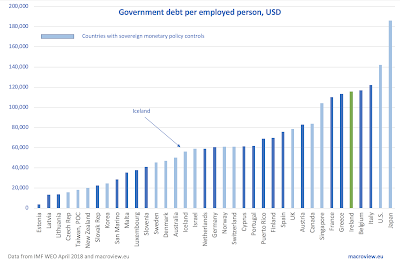 Fiscally, structurally lower rates of growth are sustainable for Russia, but socio-politically, Russia needs serious acceleration in its growth rates to offset adverse demographic pressures (rising pensions dependencies) and global economic pressures (much faster growth rates in the Emerging Markets). 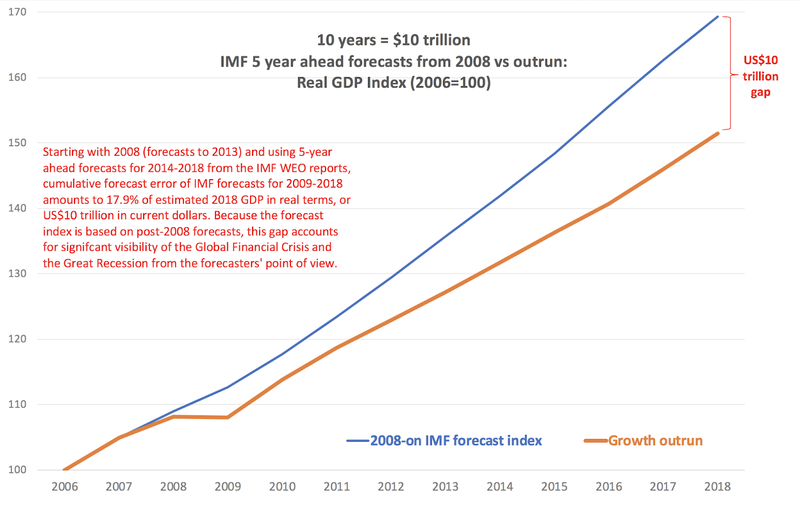 The lower bound of the 'Putin's Call' and Russian economy's sub-par performance relative to it is a clear illustration of the Middle Income Growth Trap that Russia has entered ca 2010 post-GFC and the Great Recession (see https://www.global-economic-symposium.org/knowledgebase/escaping-the-middle-income-trap for the definition and here http://trueeconomics.blogspot.com/2015/04/18415-escaping-middle-income-trap.html for discussion. 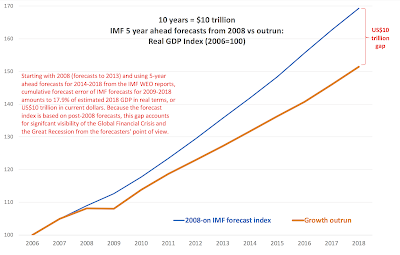 My earlier post on the subject for Russia here: http://trueeconomics.blogspot.com/2014/01/2212014-russia-and-middle-income-trap.html). Global Manufacturing PMI averaged 52.5 in 3Q 2018, down from 53.2 in 2Q 2018. This is the lowest reading for the index in 8 quarters, signalling slowest growth in global manufacturing sector since 3Q 2016. It also marks the second consecutive quarter of declining Global Manufacturing PMI. Global Services PMI averaged 53.5 in 3Q 2018, the lowest reading in 7 consecutive quarters, matching the lowest point in 8 consecutive quarters. This marked the first quarter of declines in Services sector activity, and the drop was sharp: down from 54.2 in 2Q 2018. Global Composite PMI averaged 53.3 in 3Q 2018, down from 54.0 in 2Q 2018 and 54.2 in 1Q 2018, marking the lowest reading in 8 consecutive quarters. The slowdown in the overall global economic indictor has also been sharp in 3Q 2018 and most of this slowdown took place in August and September. Overall, these are not great signs for the global economy. 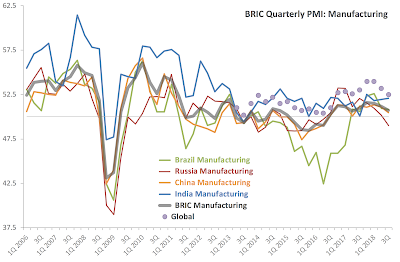 For BRIC Manufacturing PMIs analysis for 3Q 2018, see here: http://trueeconomics.blogspot.com/2018/10/11018-bric-manufacturing-pmi-dips-down.html. 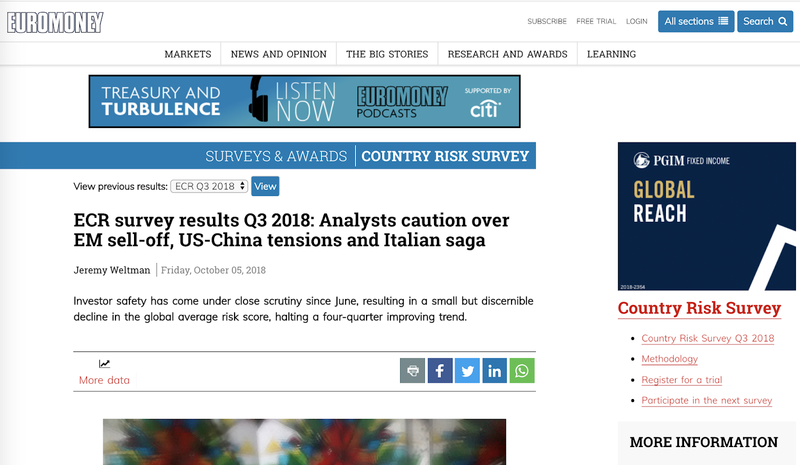 BRIC Services PMIs and BRIC Composite PMIs analysis is to follow, so stay tuned. 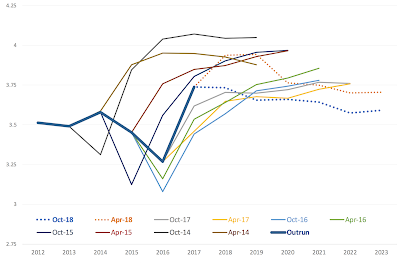 Wading through the ever-excellent Yardeni Research notes of recent, I have stumbled on a handful of charts worth highlighting and a related blog post from my friends at the Global Macro Monitor that I want to share with you all. "Supply shortages, induced mainly by central bank quantitative easing have been a major factor driving asset markets, in our opinion. Not all, but a big part." So forget the 'not all' and think about risks pairings in a complex financial system of today: equities and bonds are linked through demand for yield (gains) and demand for safety. If both are underpricing true risks (and bond markets are underpricing risks, as the quote implies), it takes one to scratch for the other to blow. Systems couplings get more fragile the tighter they become. 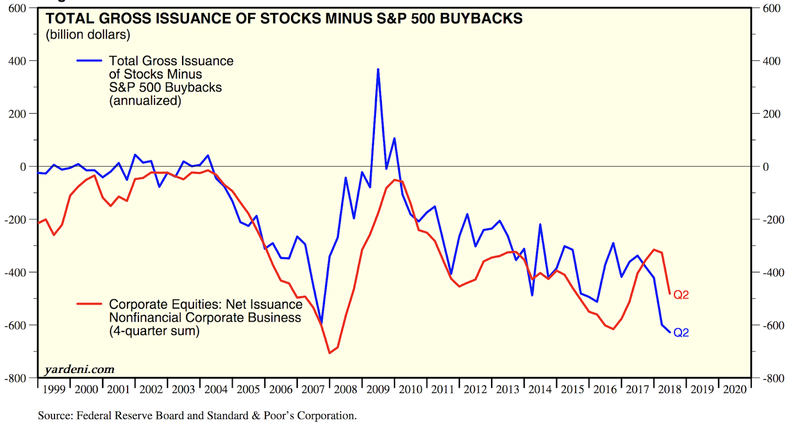 "The float of total U.S. equities has shrunk dramatically, in part, due to cheap financing to fund share buybacks. The technical shortage of stocks have helped boost U.S. equity markets and killed off most bears and short sellers." 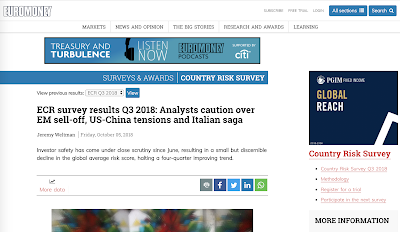 In other words, as I have warned repeatedly for years now, U.S. equity markets are now dangerously concentrated (see this blog for posts involving concentration risks). This concentration is driven by three factors: M&As and shares buy-backs, plus declined IPOs activity. The former two are additional links to monetary policies and, thus to the bond markets (coupling is getting even tighter), the latter is structural decline in enterprise formation and acceleration rates (secular stagnation). This adds complexity to tight coupling of risk systems. Bad, very bad combination if you are running a nuclear power plant or a major dam, or any other system prone to catastrophic risk exposures. How bad the things are? 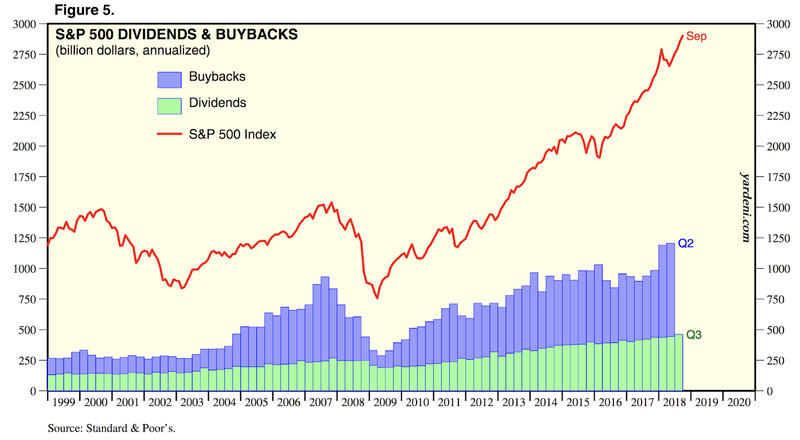 Since 1Q 2009, total cumulative shares buy-backs for S&P500 amounted (through 2Q 2018) to USD 4.2769 trillion. What am I looking at here? 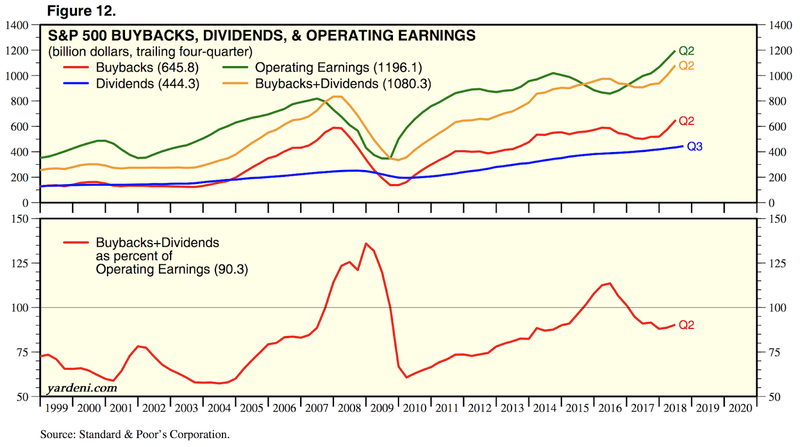 The signals revealing flow of corporate earnings toward investment, or, the signs of the build up in the future economic capacity of the private sector. The red line in the lower panel puts this into proportional terms, the gap between the yellow line and the green line in the top panel puts it into absolute terms. And both are frightening. Corporate earnings are on a healthy trend and at healthy levels. 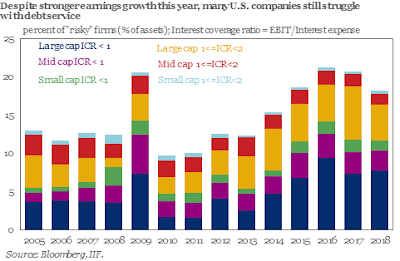 But corporate investment is not and has not been since 1Q 2014. This chart under-reports the extent of corporate under-investment through two things not included in the red line: (1) M&As - high risk 'investment' strategies by corporates that, if adjusted for that risk, would have pushed the actual investment growth even lower than it is implied by the red line; and (2) Risk-adjustments to the organic investments by companies. In simple terms, there is no meaningful translation from higher earnings into new investment in the U.S. economy so far in 2018 and there has not been one since 2014. Put differently, U.S. economy has been starved of organic investment for a good part of the 'boom' years. 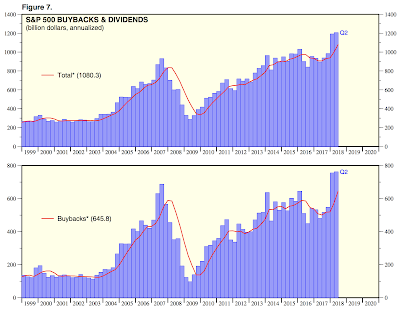 And what causes the latest spike in buybacks? 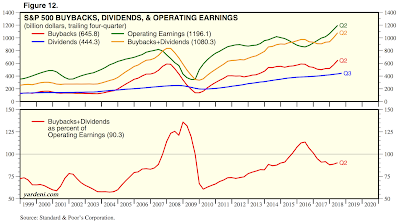 No, not growing earnings (which are appreciating, but moderately). The fiscal policy under the Tax Cuts and Jobs Act 2017, or Trump Tax Cuts. Let's circle back: monetary policy madness of the past has been holding court in bond markets and stock markets, pushing mispricing of risks to absolutely astronomical highs. We have just added to that already risky equation fiscal policy push for more mispricing of risks in equity markets. This is like dumping picnic-sized bags of ice into the cooling system to run the reactor hotter. And no one seems to care that the bags of ice are running low in the delivery truck... You can light a smoke and watch ice melt. Or you can run for the parking lot to drive away. As an investor, you always have a right choice to make. Until you no longer have any choices left. Russia Manufacturing PMI averaged miserly 49.0 in 3Q 2018, down from anaemic 50.2 in 2Q 2018. This was the lowest quarterly reading since 3Q 2015 when the Russian economy was in an official recession. 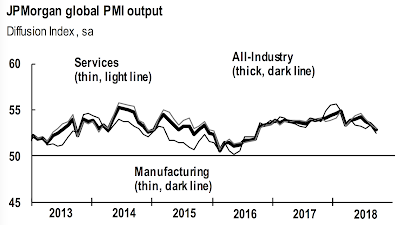 Russia is the only BRIC economy nominally in contraction territory, when it comes to PMIs-signalled manufacturing sector activity, and 49.0 is statistically close to being sub-50 reading as well. Brazil’s Manufacturing PMI remained broadly unchanged on 2Q 2018 reading of 50.9 at 50.8 in 3Q 2018. Although notionally above 50.0 mark, statistically, the reading was not significantly different from zero growth signal of 50.0. 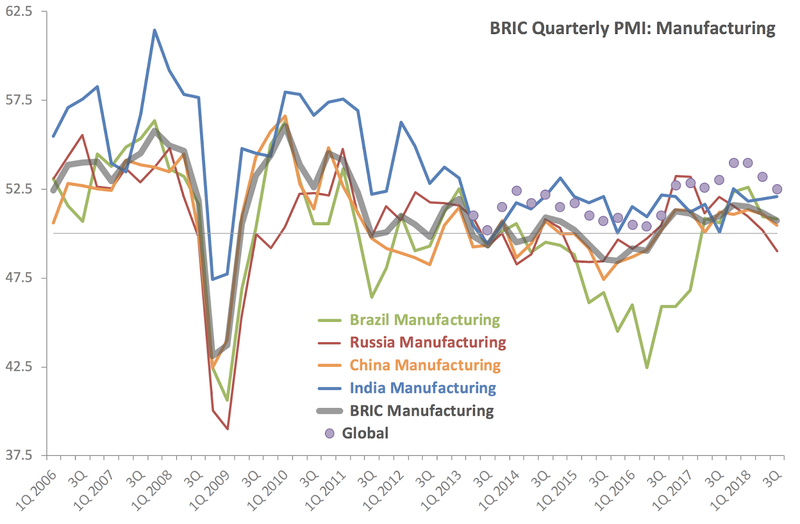 This means that both Russian and Brazilian economies registered deteriorating PMIs over two consecutive quarters in the case of Brazil and 4 quarters in the case of Russia. China Manufacturing PMI was at disappointing 50.5 in 3Q 2018, down from a weak 51.1 reading in 2Q 2018. 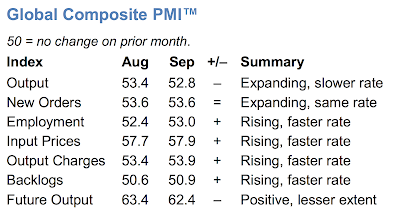 This marks the worst reading in China PMI in five quarters. As with Brazil, China’s Manufacturing PMI for 3Q 2018 was not statistically distinct from 50.0. India Manufacturing PMI was the only one that remained statistically in expansion territory at 52.1 in 3Q 2018, basically unchanged on 52.0 in 2Q 2018 and barely up on 51.8 in 1Q 2018. Meanwhile, Global Manufacturing PMI averaged 52.5 in 3Q 2018, down from 53.2 in 2Q 2018 and 54.0 in 4Q 2017 and 1Q 2017. All in, Global PMI has finished 3Q 2018 at the lowest level in 8 consecutive quarters. 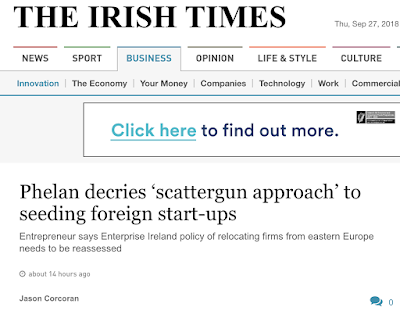 Recent article in the Irish Times looks at some of the industry views on entrepreneurship in Ireland and Enterprise Ireland funding programs. Some of the comments included are from myself.